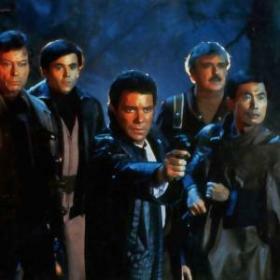 Star Trek III: The Search for Spock, even three-plus decades after its release, remains a pivotal adventure for Kirk, Spock, McCoy and the rest of the Star Trek: The Original Series crew. They boldly went. And then went back and changed it. "Janeway embodied goodness as well as boldness, passion as well as intelligence," Kate Mulgrew says of her "Star Trek" character. 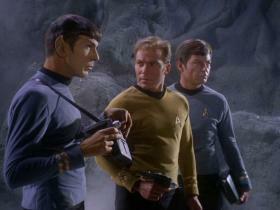 From the return of Spock to the lighter tone, this IS your father's Star Trek. Did Star Trek peak too early? 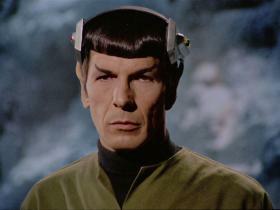 Dismissed as “frivolous” by Mr. Spock himself, the episode—in which the U.S.S. Enterprise is overrun by fuzzy creatures—started with a 23-year-old college student taking inspiration from his pet mice. 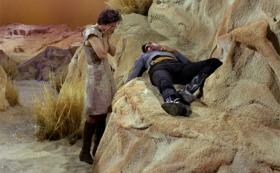 In some alternate timeline, "City on the Edge of Forever" has a flawed Kirk and a darker plot. 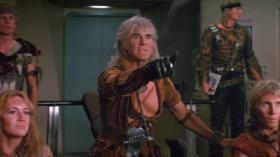 Star Trek II: The Wrath of Khan was a success on the strength of its villain. But the William Shatner wasn’t sure a returning series villain was such a good idea. 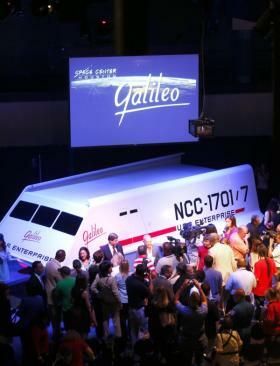 Star Trek News - Sonequa Martin-Green unveiled the Discovery trailer during the CBS upfronts today in NYC. Read on for details -- and news about premiere date, episode count and more. 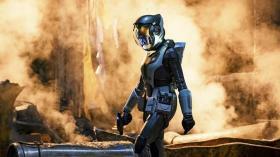 Star Trek News - The worst-kept secret in the universe now has been confirmed officially: Sonequa Martin-Green will beam aboard Star Trek: Discovery. Star Trek Happy 50th Anniversary, Star Trek! 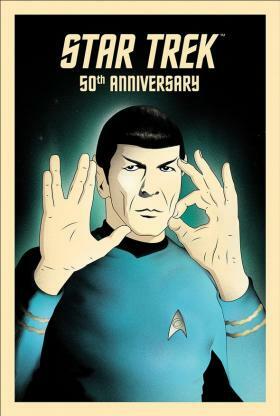 Star Trek 50 Artists 50 Years celebrates the rich history of the sci-fi series. Check out some of the funny, colourful and stunning pieces in the exhibition. This is very sad news. He was only 27. 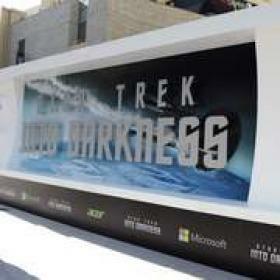 LNews - The countdown to Star Trek's 50th anniversary has begun, and StarTrek.com has a preview of official projects and events coming your way in 2016. Star Trek News -- William Shatner beamed into the CMAs last night... as a Stormtrooper! Shatner is great. He also looks amazing. 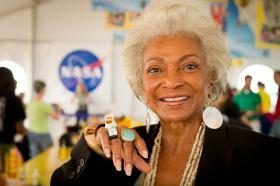 Star Trek News - Nichelle Nichols continues to live long and prosper. NASA has just released new photos and video from the Star Trek legend's recent trip into the skies as part of the space agency's SOFIA mission. 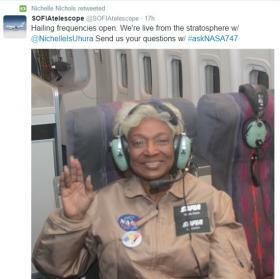 Star Trek News - Nichelle Nichols ventured into skies earlier this week as part of NASA's SOFIA mission, and StarTrek.com has compiled her tweets and photos about the experience. 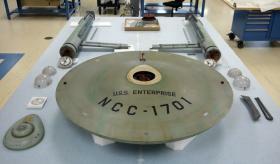 Star Trek News - In a new guest blog, the Smithsonian National Air & Space Museum asks Star Trek fans for their help in restoring the 11-foot studio model of the USS Enterprise used in all 79 TOS episodes. Star Trek News - William Shatner will beam down to San Diego Comic Con next month to read excerpts from The Autobiography of James T. Kirk. Actress Nichelle Nichols, who played the Enterprise‘s communications officer Lieutenant Uhura on the original “Star Trek” TV series, has suffered a mild stroke. News - StarTrek.com guest blogger, in his latest piece, celebrates Mother's Day with a tip of his cap and the virtual delivery of flowers to Star Trek's moms and mother figures. For all the moms who love Trek! 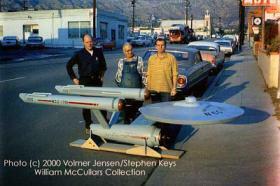 An artist in San Francisco stitched photos of the starship Enterprise's original TV model into Star Trek movies. These are amazing. You have to check this out! 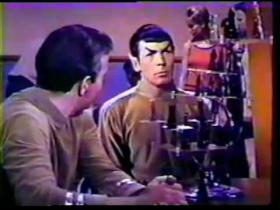 Mr. Bennett started out as a young radio star then went on to produce four “Star Trek” films and television movies. So this is a shocker! The sci-fi flagship is many things: a drama, a comedy, a series about ideas, a competition to see who can eat the most scenery, and much, much more! Like you need a guide! Star Trek News - William Shatner is beaming over to Clangers and will serve as the Narrator of Sprout's upcoming reboot of the old British children's show. 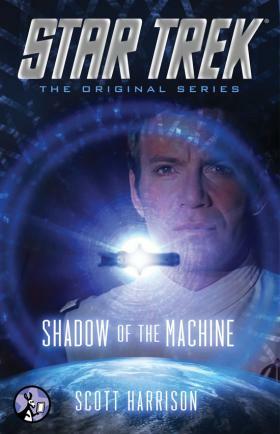 Star Trek News - Simon & Schuster/Pocket Books will release Star Trek: The Original Series: Shadow of the Machine as an eNovella in March, and StarTrek.com has details. This seems worth $3.99 to me! A little late, but still very cool! 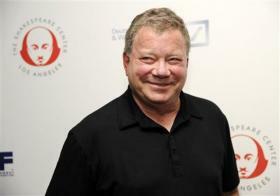 NEW YORK (AP) &mdash; "Star Trek" may be the next frontier for William Shatner &mdash; again. 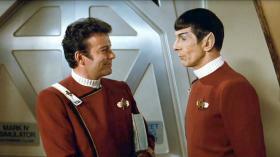 News - Trek legends William Shatner and Leonard Nimoy reunite for a charming Volkswagen Germany commercial. Check it out at StarTrek.com. 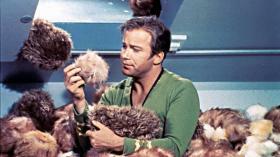 The Top 100 Star Trek Episodes Of All Time! 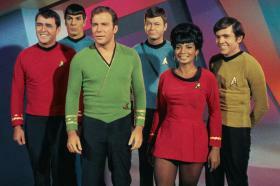 William Shatner Confirms He Was Contacted About Star Trek 3 And He Would Love To Do It! News - StarTrek.com has exclusive preview pages from IDW's Star Trek: Harlan Ellison’s City on the Edge of Forever, Issue #2, out on Wednesday. 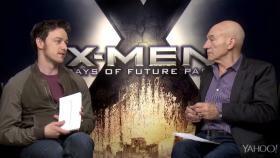 Watching Michael Fassbender And James McAvoy do impressions of their future selves in the X-Men movies right in front of the magnificent actors who play said future selves, Patrick Stewart and Ian McKellen, is WONDERFUL. 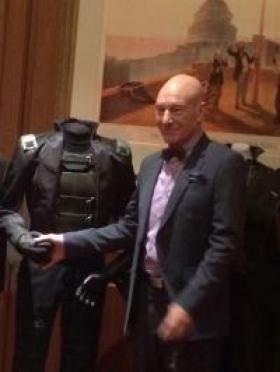 The actor unveiled multiple 'X-Men' costumes being donated to the National Museum of American History. Unaired Star Trek 2nd Pilot Intro! The unaired intro to the 2nd pilot! Enjoy! 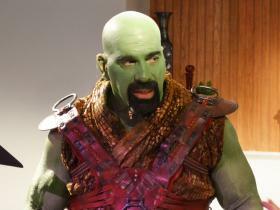 The original 'Hulk' is back in green for Kingsland Star Trek webfilm! The original Incredible Hulk is back in green makeup again, going through a daily 4-hour makeup procedure in Kingland to become part of sci-fi production that just premiered on the Internet near you. 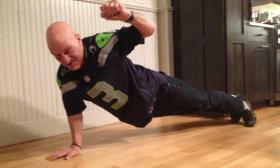 His X-Men alter-ego may be confined to a wheel chair, but Sir Patrick Stewart is fighting fit at 73. 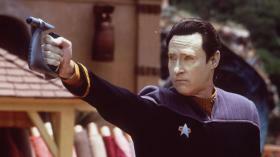 Star Trek Replicator Nearing Reality? 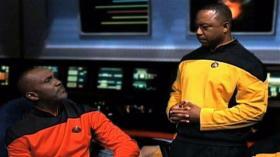 News - Need proof that Star Trek's food replicator is nearing reality? Check out this video of a 3D printer making... pizaa. 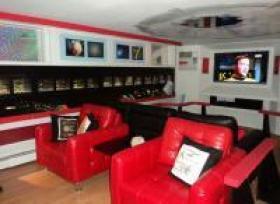 This Girl Spent $30,000 Converting Her House Into... WHAT? I Don't Know If This Is Nerdy Or Awesome. There's a certain group of people that will LOVE this girl. I may have to move in. Wow. 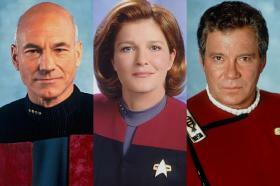 News - Thousands of fans voted are your favorite Star Trek time travel episode has been determined. Read on for details! 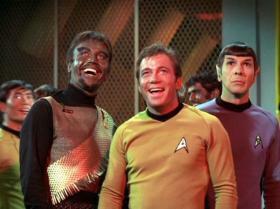 Star Trek If it was made with the same soundtrack as the Monty Python and the Holy Grail. Not news, but I couldn't resist! News - Former Starlog editor David McDonnell recounts a memorable Thanksgiving spent in the company of Star Trek guest star and 2001: A Space Odyssey icon Gary Lockwood. 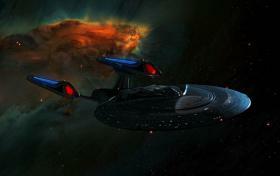 News - Juan Ortiz and his Original Series art are getting the gallery treatment in L.A. StarTrek.com has details! News - Twizzlers combine to form the U.S.S. 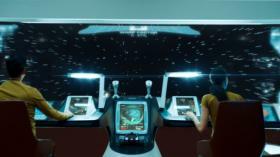 Enterprise in a sweet new commercial. See it now at StarTrek.com! STARLOGGING WITH DAVID MCDONNELL: What Are Robert Blochs Made Of? News - StarTrek.com pays tribute to Lou Scheimer, co-producer of Star Trek: The Animated series, who has passed away at age 84. 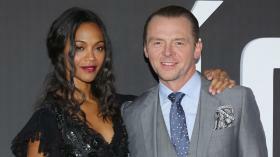 Star Trek To Boldly Return To TV Screens? 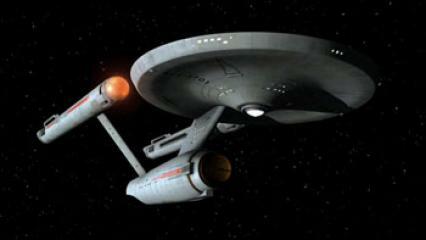 Does General Electric's 'Star Trek' Ad Bid NBC A Quiet Adieu? One Trek Mind: 5 Reasons To Stop Worrying And Love "Spock's Brain"
News - Guest blogger Jordan Hoffman marks the 31st anniversary of the Wrath of Khan's release by comparing/contrasting Khans new and old. 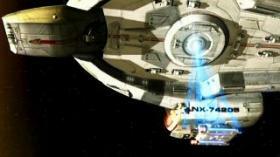 News - The Novogeek has just introduced a very cool Star Trek Phaser Laser Pointer. 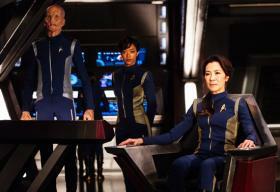 StarTrek.com has pics and details! Nobody’s going to win an Emmy for a $60,000 parody of the TV show “Star Trek” filmed by Internal Revenue Service employees at an agency studio in Maryland. Instead, the IRS got a rebuke from Congress for wasting taxpayer dollars. 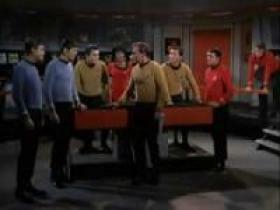 Mixing in a little politics with the Star Trek. 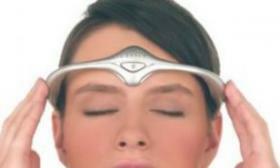 A study from Liege University in Belgium found the band, worn across the forehead for 20 minutes a day, reduced the debilitating attacks by a third. Not exactly Trek, but still cool! 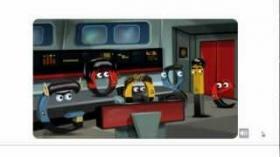 News - Fans are loving the new Star Trek MIMOBOTS from Mimoco. Today, StarTrek.com speaks with Mimoco about how they added in all the cool Trek bonus material to the flash drives. A team of scientists has created a real-life miniature tractor beam - as featured in the Star Trek series - in a development which may lead to more efficient medical testing.